Yorke has a surprise release. But wait...we all know about it! 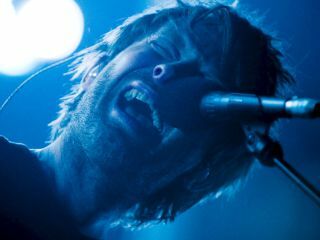 Radiohead frontman Thom Yorke is reportedly prepping the release of a limited edition 12-inch featuring two new songs, Apart By Horses and The Hollow Earth, due 22 September. And when we say 'limited,' we mean really limited: word is that just 8,400 copies of the vinyl disc will be available worldwide - 4,000 in Europe, 4,000 in the US and a scant 400 in Canada. The vinyl-only release will reportedly be handled by the ATO sublabel TBD Records, with Sonic Unycon assuming distribution in Canada. According to sources, the 12-inch has "really awesome packaging and artwork." Other than that, no more information has been offered regarding the release. Yorke's solo release comes on the heels of All For The Best, his contribution to the benefit album for songwriter Mark Mulcahy called Ciao My Shining Star: The Songs Of Mark Mulcahy. In addition, Radiohead have recently issued the tracks Harry Patch (In Memory Of) and These Are My Twisted Words. And if that weren't all, Yorke is said to perform a solo acoustic version of the title track to the anti-global warming documentary The Age Of Stupid, when it premieres on 21 September.